Available to Dubli.com customers in the UAE and Saudi Arabia, MR PORTER is the award-winning online luxury retail destination for men’s style, combining the best international menswear with expert advice and inspirational content. MR PORTER is the global go-to for fashionable men around the world. The site sells over 450 leading international brands, with new products added three times a week. Designers available include Tom Ford, Brunello Cucinelli, Balenciaga, Gucci, Polo Ralph Lauren, Loro Piana, A.P.C, Amiri and Nike, among others. What’s happening at MR PORTER this summer? We are glad you asked! MR PORTER’s curated collection of summer faves has caught our attention. Gentlemen, start listening! 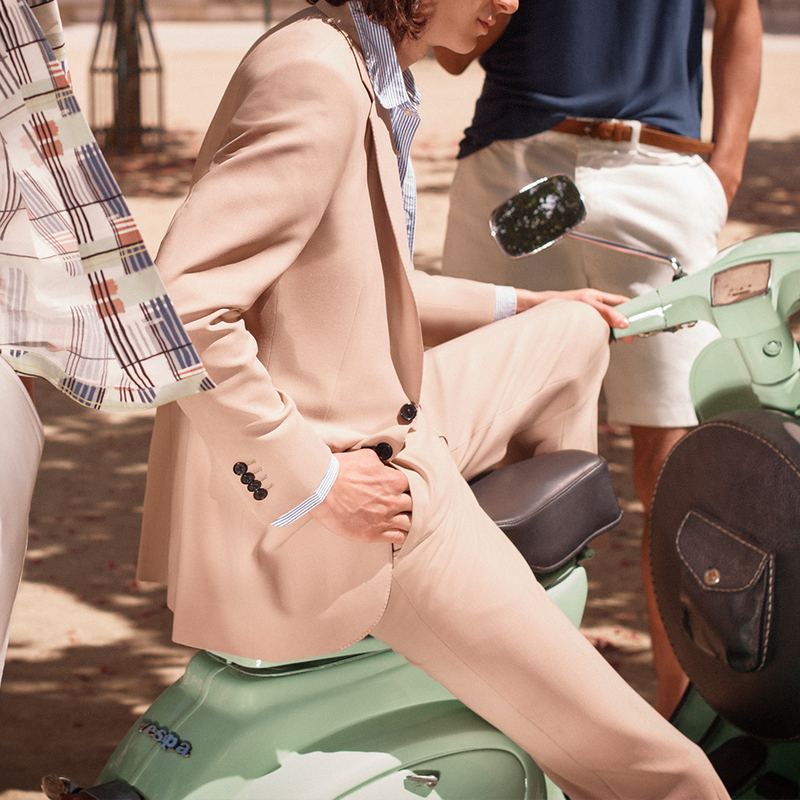 Launched in April, MR PORTER made its global High Summer campaign available; showcasing 10 of their key categories for summer from the April – September period. What are MR PORTER’s luxury labels serving up this summer? Check out Tod’s Gommino Suede Driving Shoes. It’s universally agreed upon that Italian men are pretty snappy dressers – some are surely innate, but easy access to brands like Tod’s doesn’t hurt. These dark-brown suede driving shoes have a lightweight, flexible feel and are finished with the style’s signature pebbled rubber soles. These luscious shoes are currently 310£ on MR PORTER. Also sizing up this summer on MR PORTER is their Vive La France section; an exclusive collection of capsules inspired by the lifestyle and culture of France from 14 of MR PORTER’s favorite French casualwear brands. From the Parisian boulevards to the sun-drenched Riviera, France is a hotbed for effortlessly cool casual wear. This summer, MR PORTER celebrates the current mood in French menswear with a series of exclusive capsule collections from some of their favorite Gallic brands. Expect new pieces from old friends, such as AMI and Officine Generale, alongside new-to-MP brands such as De Bonne Facture and Husbands. Running, skiing, sailing or golf: whatever your sport of choice, do it in style with MR PORTER’s selection of performance sportswear from the world’s best brands. MR PORTER showcases a wide variety of performance sports apparel and accessories on their sports page. Find all the fan favorites; Nike, Adidas, Under Armour and much more. In the market for a new designer timepiece? You might also check out MR PORTER’s luxury watch guide. The Luxury Watch Guide is a new area of the MR PORTER site and will deliver the ultimate destination for luxury watches and watch enthusiasts alike. Included in their latest lineup is Breitling, which recently launched on MR PORTER with a curated selection of 31 timepieces from across the brand’s iconic product families including a limited edition of the newly-launched Navitimer 8 collection. Check out MR PORTER’s summer sale for 70% off your favorite luxury labels, until July 24. You’ll be wearing your favorite designer labels and earning Cash Back on the summers hottest styles.